They can open doors, operate printers, or buy smoothies with a wave of the hand. STOCKHOLM — The syringe slides in between the thumb and index finger. Then, with a click, a microchip is injected in the employee’s hand. The technology in itself is not new. Such chips are used as virtual collar plates for pets. Companies use them to track deliveries. It’s just never been used to tag employees on a broad scale before. Epicenter and a handful of other companies are the first to make chip implants broadly available. And as with most new technologies, it raises security and privacy issues. While biologically safe, the data generated by the chips can show how often an employee comes to work or what they buy. Unlike company swipe cards or smartphones, which can generate the same data, a person cannot easily separate themselves from the chip. “Of course, putting things into your body is quite a big step to do and it was even for me at first,” said Mesterton, remembering how he initially had had doubts. Epicenter, which is home to more than 100 companies and some 2,000 workers, began implanting workers in January 2015. Now, about 150 workers have them. A company based in Belgium also offers its employees such implants, and there are isolated cases around the world where tech enthusiasts have tried this out in recent years. The small implants use Near Field Communication (NFC) technology, the same as in contactless credit cards or mobile payments. When activated by a reader a few inches away, a small amount of data flows between the two devices via electromagnetic waves. The implants are “passive,” meaning they contain information that other devices can read, but cannot read information themselves. 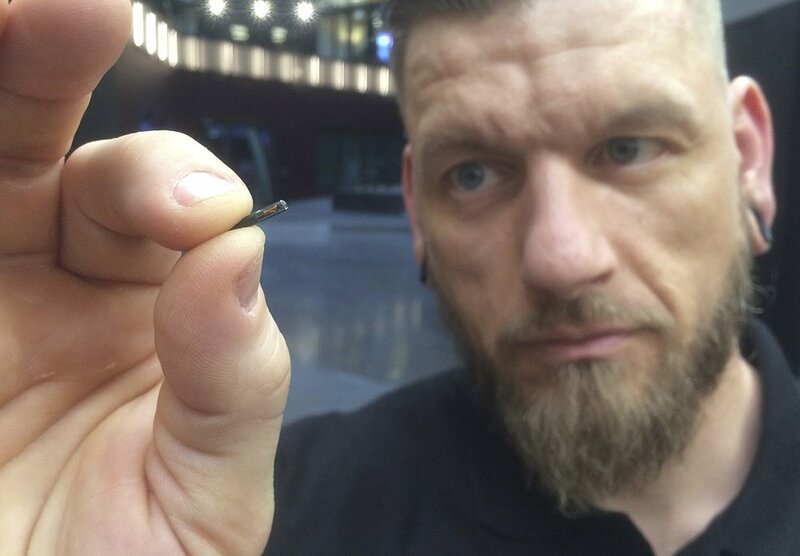 Ben Libberton, a microbiologist at Stockholm’s Karolinska Institute, says hackers could conceivably gain huge swathes of information from embedded microchips. The ethical dilemmas will become bigger the more sophisticated the microchips become. Libberton said that if such data is collected, the big question remains of what happens to it, who uses it, and for what purpose. So far, Epicenter’s group of cyborgs doesn’t seem too concerned. The implants have become so popular that Epicenter workers stage monthly events where attendees have the option of being “chipped” for free. He injects the implants – using pre-loaded syringes – into the fleshy area of the hand, just next to the thumb. The process lasts a few seconds, and more often than not there are no screams and barely a drop of blood. “The next step for electronics is to move into the body,” he says. Sandra Haglof, 25, who works for Eventomatic, an events company that works with Epicenter, has had three piercings before, and her left hand barely shakes as Osterlund injects the small chip. “I want to be part of the future,” she laughs. The AP’s Matti Huuhtanen in Helsinki contributed to this report.